Honda monkeybikes – supposedly named because an adult riding one looks like a circus monkey hunched over the comically small bike – are one of those weird subsets of motorcycling that you either look at with bemusement or enjoy to an inordinate degree. While I wasn’t fortunate enough to have a Z50 as a kid like many of my riding buddies did, I have had the opportunity to goof around with them in parking lots and go-kart tracks in my adult years, and nearly broke both my legs when I flipped one over – I still get a twinge of pain in my kneecaps whenever I see a Honda fiddy. They are silly, inexpensive, and a lot more fun than their goofy appearance would suggest. It is not really a surprise that Honda mini’s have a strong cult following. 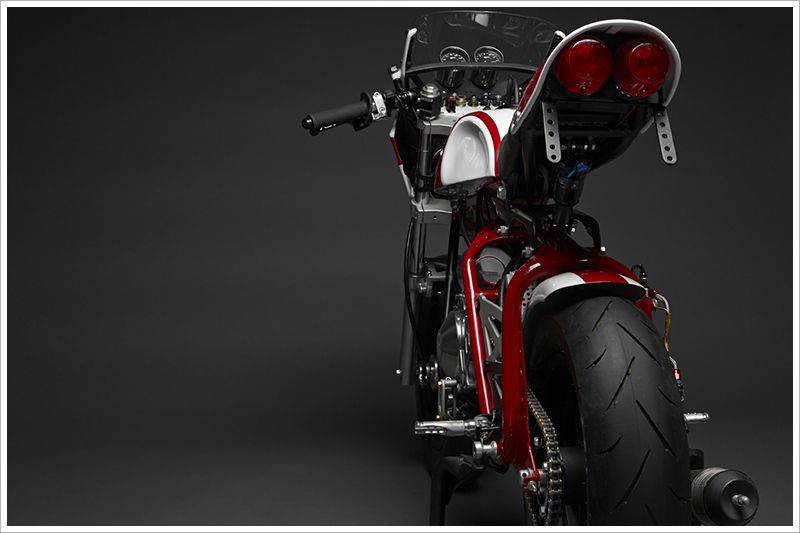 What is surprising is how some builders like Mr. Morales invest an obscene amount of time and money into their minibikes, producing custom machines of such incredible detail and quality that they might be featured on sites like this. David, who resides in Denton, Texas, has been building and restoring minibikes for the past twelve years, and has even been featured on these hallowed pages with one of his previous builds – a customized 1977 Honda CT70. David rode motorbikes in his youth but gave up the sport for many years, focusing mainly on classic car restorations and metal fabrication. He started tinkering with mountain bikes, one thing led to another, and he returned to the motorbike scene and started playing with the small displacement bikes that he remembered from his childhood. Since then he has become a member of The World Famous Wheelie-ing Elvi (“Daredevil Mini-Motorcycle Riders… Extraordinaire!”), a ragtag band of outlaw minibike riders who prowl the streets of Dallas and Fort Worth Texas and perform dangerous feats of daring with their tiny rides… while wearing circa 1975 sequin and polyester Elvis garb, and pompadours so large they are DOT approved. Being a minibike enthusiast is serious business. Uh huh huh. David has become quite handy with tiny Hondas, restoring various models in his spare time at a rate of about 7-8 machines per year. Additionally he is a skilled fabricator with an eye for detail. Combine that with a lot of in-depth knowledge about these machines and you have the perfect storm for the production of some cool customs. When Dave comes across a project that is too far-gone or a basketcase that is beyond saving, out comes the sawzall and his creativity goes into overdrive. This is how a tired, rusty, cracked-frame 1969 Z50A became the “50 Magnum” – an oversized, hot-rodded mini designed and built to be ridden by a slightly deranged adult. Concours-judging monkeybike rivet-counters may want to stop reading at this point. 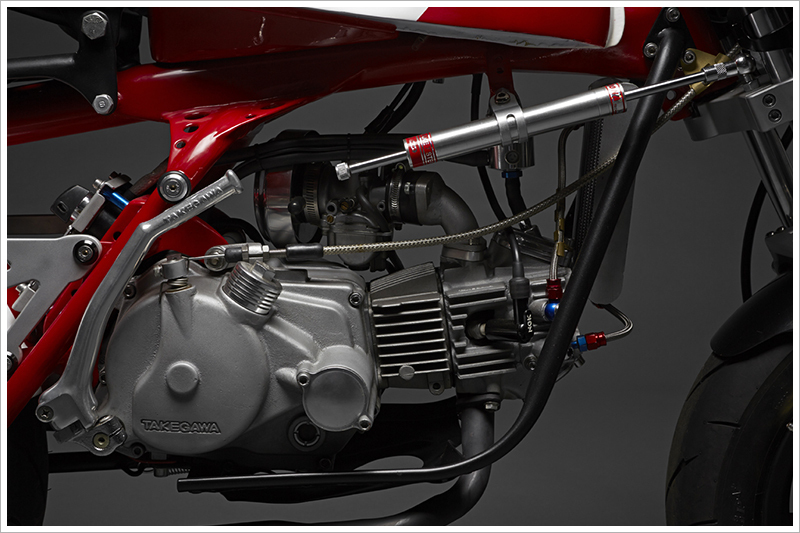 The Z50M was introduced in the Japanese market in 1964 as a collapsible minibike powered by an air-cooled four-stroke overhead cam 49cc single – high quality stuff compared to the usual lawnmower-engined homebrew specials most people were accustomed to at the time. If you were lucky you might have a production kit like a Taco, which still looked less sophisticated than the lawnmower that gave up its powerplant to build it. 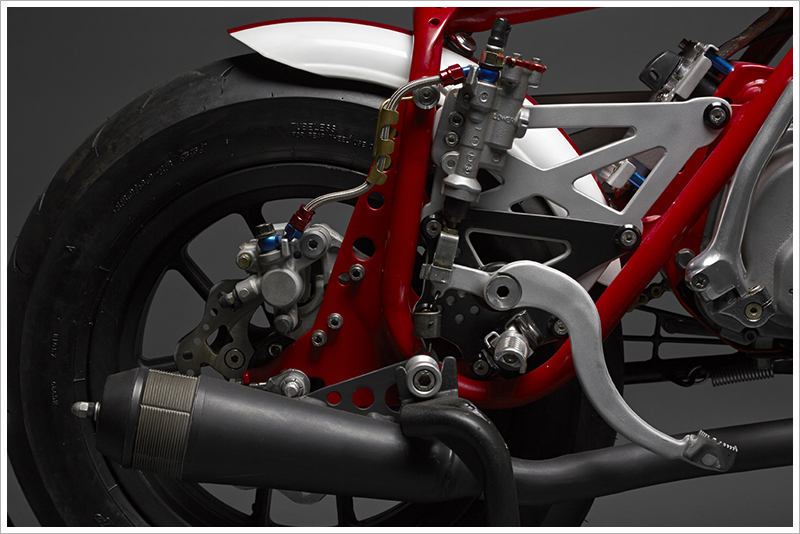 Imagine going from a pull-start, direct-drive, suspension-free, cobbled-together contraption with a friction brake to an honest-to-Soichiro miniature motorcycle. Not only that, but the Z50 wasn’t that much more expensive considering the huge leap in refinement. The Z50 had a 3 speed transmission, legitimate brakes, real bike styling, lights, a kickstart, and a refined engine that was smooth, powerful (a tire-shredding 1.95 hp on the Cycle World dyno), and dead-nuts reliable. You could even get it with a semi-auto gearbox. All of this for 200$ (1968), vs the $130 you’d pay for the average Briggs and Stratton special. 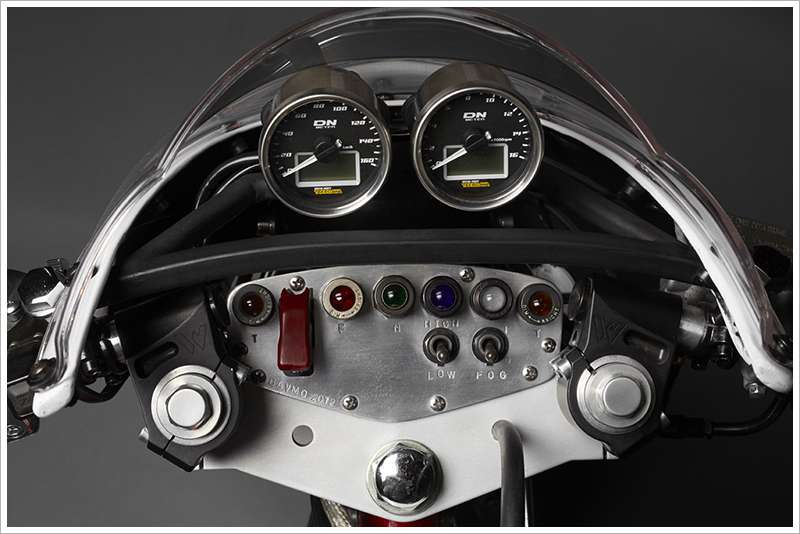 The Z50A was the second generation machine and the first to be sold in North America in 1968. While highly refined compared to the competition, the Honda fiddys were not without their faults. Chief among their failings was a tendency to crack their fragile frames in multiple locations, due to a combination of a weak frame design and a rigid rear end (a rear suspension would be introduced in 1972 to mitigate the problem). Dave’s ’69 donor machine was so afflicted. In fact, it was downright horrifying. The previous owner gave Dave the rusted-out hulk for free, and he had his work cut out for him. Aside from the general state of neglect, the frame had cracked at every junction and been badly re-welded, and most of the mounting lugs were either mangled or missing. Some sections were thinned to the point of having the structural integrity of a paper bag. It was clear that there was no hope in rebuilding it back to new condition, so Dave decided to start chopping and reworking the frame to satisfy an idea he had been mulling over – an adult-sized Z50. The problem with minibikes is that they are… mini. 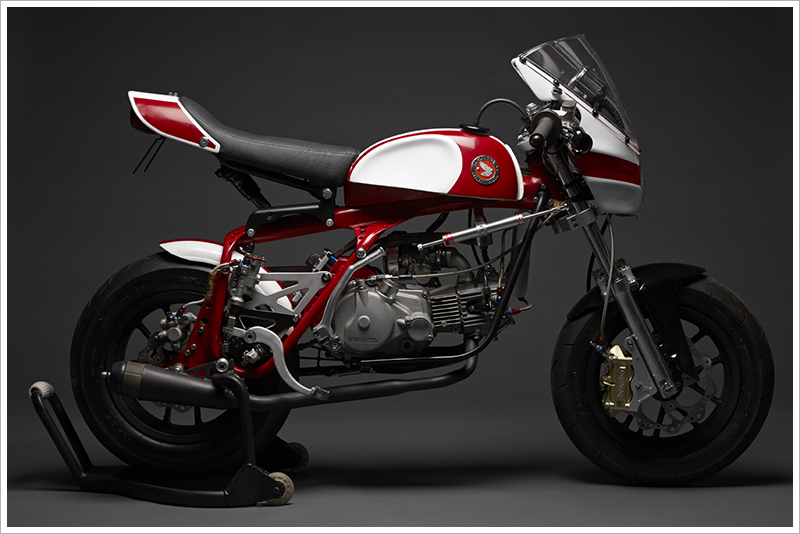 Adult enthusiasts have long suffered from hunched backs and compressed spines in their pursuit of tiny motorcycling bliss, and Dave wanted to address this issue by building a super-sized Z50 that would address most of the weak points of the model – hence the name Magnum. He accomplished this by lengthening the frame four inches and raising it another two, and things went downhill from there. David reinforced and rebuilt the enlarged frame and fitted a sprung saddle (held aloft by a Fox mountain bike shock) to keep the hardtail from breaking his spine. A set of hand-finished aluminum side panels clean up the look and serve a structural purpose, reinforcing the rear frame loops and providing rear-set mounting points. As front fork options are limited for Z50As, he then modified the headstock to fit a set of Trail Bike triples mated to a set of rebuilt and lengthened NSR50 forks with ZB50 lowers, reinforced with a custom fork brace, improving the crude front suspension and offering a better front wheel/brake combo – the front brake being a “definition of overkill” radial mount Brembo quad-piston caliper mated to a CRF450 master via stainless lines. Wheels are 12 inch alloy items intended for an NSR50 with some sticky Dunlop radials spooned on. 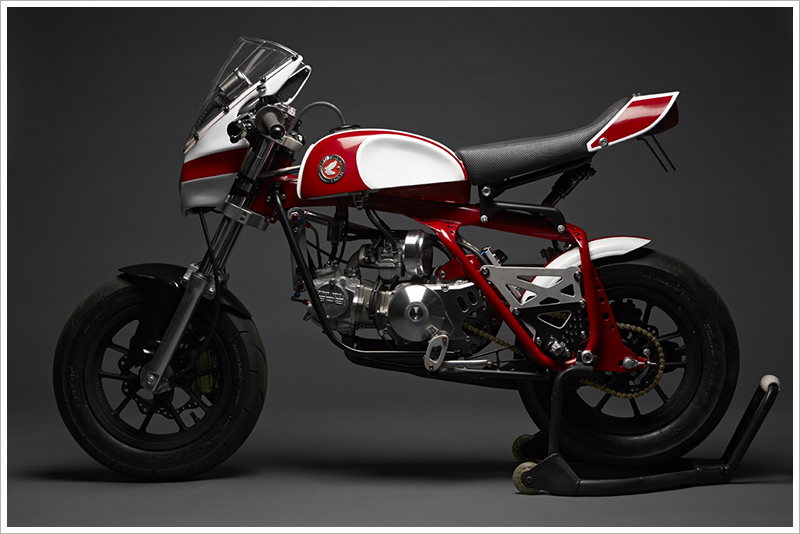 Style-wise the Magnum features a reworked 1973 SL70 fuel tank that David reformed by hand on a wood buck. 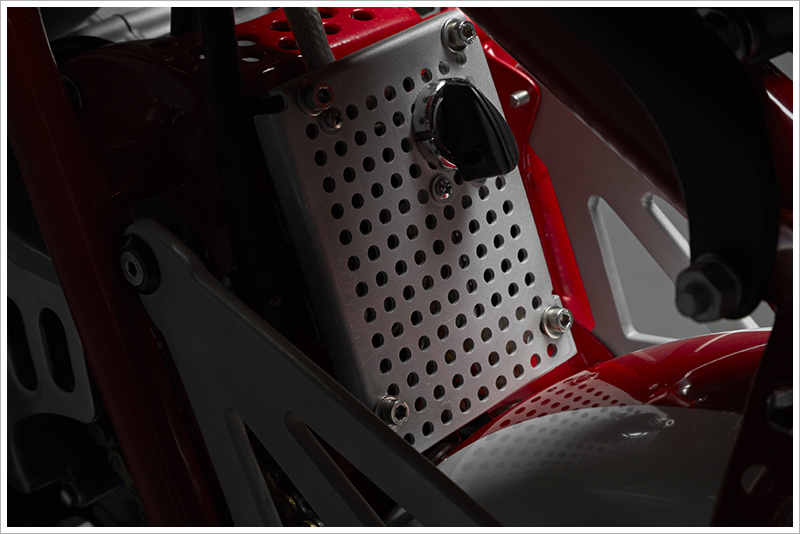 The front and rear fairings are one-offs – formed steel at the rear, hand-laid fibreglass at the front. Some cool details abound if you take the time to examine the Magnum carefully: the idiot-light panel features WWII-era vintage aircraft instrument lights modified to accept LEDs, the ignition housing is salvaged from an ultrasound machine, the hand-made centrestand does double-duty as a chain guard when folded, and so on. David is a master of cramming massive amounts of subtle detailing and workmanship into a tiny package – take the time to look over the machine and you’ll discover hundreds of cool little one-off pieces, and you will quickly realize that very little has been taken straight off the shelf. Simply slapping together a bunch of parts isn’t David’s style, he works hard to put thought and personal craftsmanship into as many components as he can. 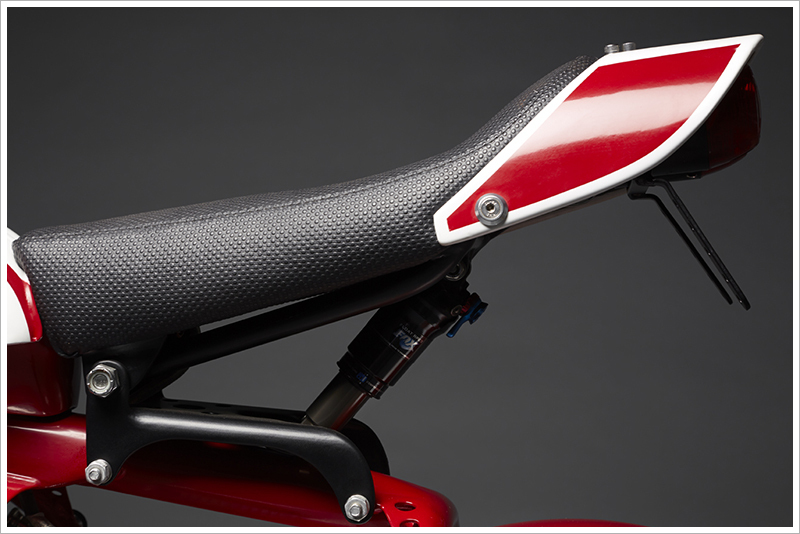 He notes that the only things he didn’t do was stitching the seat and powdercoating. The motor is, as you might expect, heavily reworked. 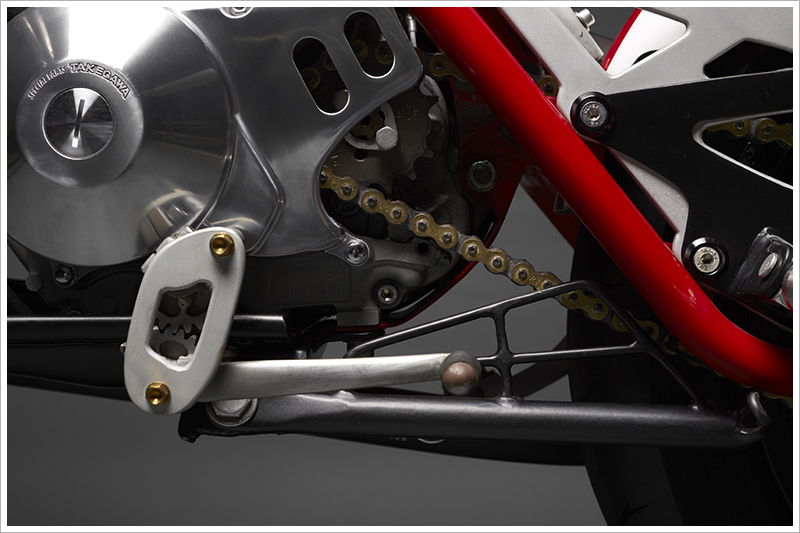 The crankcases are from a CRF50, with everything else coming courtesy of the aftermarket. The results are staggering. The Magnum has a 106cc engine, overbored with a stroker crank, a five speed Takegawa transmission, Takegawa “Super” head, an oil cooler, and lightened internals (among other work). The exhaust is built from donor pipework from a Kawasaki KLX110 and a Norton Commando, capped off with a classic Supertrapp can. While Dave hasn’t strapped the Magnum to a dyno, he reports that on a test run in his neighbourhood he was clearing 50 miles per hour in fourth gear with lots of oomph left, which sounds like the most terrifying experience I can imagine this side of neutering an un-anesthetized badger with pruning shears. Keep in mind that a Z50 usually tops out around 25 mph on a good day. Fortunately Dave says the handling is quite good and the ridiculously huge brakes work really well – though the hardtail tends to gets choppy over rough ground. And if things really get out of hand Dave had the foresight to install a side-mount steering damper. 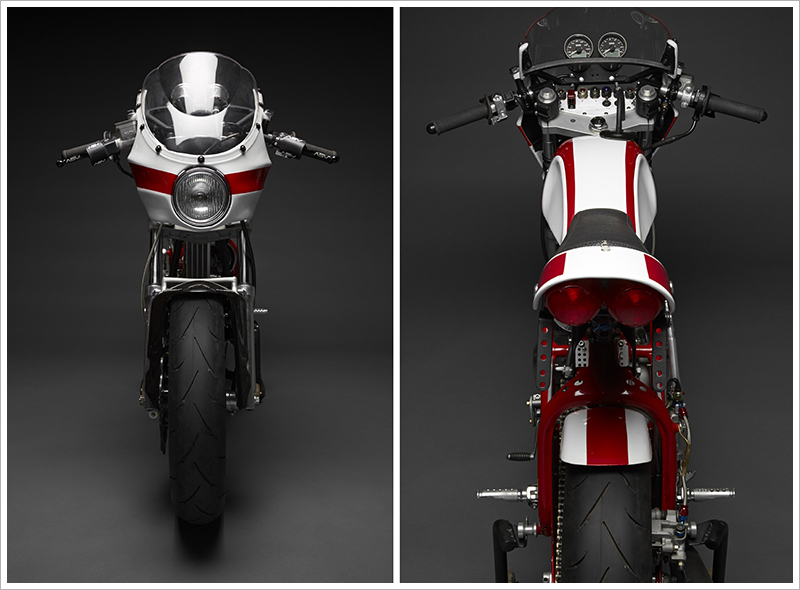 The 50 Magnum is a sight to behold, and scarcely recognizable as a monkeybike. The quality and attention to detail is exceptional and would shame a lot of professional builders, and the amount of work that has been invested into the project is staggering – it took Dave the better part of a year of constant welding, machining and fitting to build the Magnum. Dave wanted a bigger fifty, and he succeeded – and then some. With the larger wheels, taller suspension and bigger frame, the proportions are much closer to a big bike than the Z50 ever was.